Yes, the length between posts increases exponentially with each day that passes from closing. I'd love to promise that I'll work on that, but that would require a lot of work. And writing. And I'm lazy. 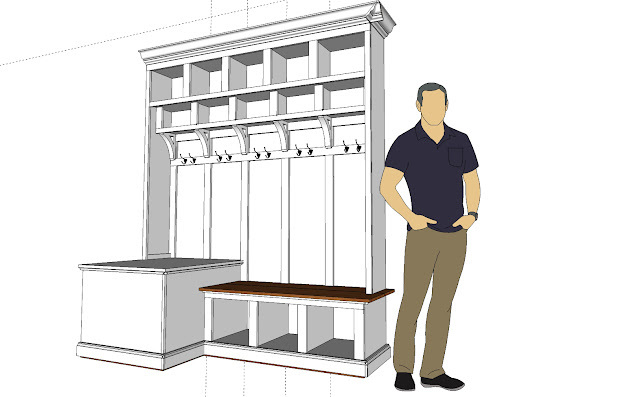 Just in time for the holidays, I dove in to tack one of the bigger projects on our list - our mudroom. Those of you with a Dunkirk (or those considering a Dunkirk), know that the mudroom is really a great space. It's just off the garage making it a prime entryway into the house. It's really good size and it already has a closet. There's an optional arrival center that Ryan Homes offers, but its really basic and we didn't think it would be a good use of the space, so we didn't opt in for it. Having live in the space for more than a year (almost two, gasp! ), our wants and needs have changed a little. We now have two cats and nowhere to hide the litter box. I considered putting a door in the wall next to the stairs so we could at least put it in the basement, but I don't like holes in walls. That seemed to be asking for trouble. As we kept looking at the space in the mud room, we thought, why couldn't we put it somewhere in here? But I refused to consider putting it in the closet - I have no desire to wear coats that smell like cat poop. Then we thought about adding something to our yet-to-be-built-custom-and-completely-imaginary arrival center. So I set about sketching something up - literally, using SketchUp Make. I stole parts of the design from a 2011 blog post on A Charming Nest, so I feel obliged to link to them. Here's what we've come up with - warning, I had some extra sheets of 3/4 plywood so I designed it to use as much of them as possible. At least it's going to be sturdy. Really, really sturdy. Instead of having a bench go all the way across, I put a rectangular, enclosed table in the corner to hold...wait for it...a litter box! The top of the table is actually a lid that will open to allow access for cleaning and there will be a entry hole somewhere to allow the cats to enter. I haven't fully decided on the best location for the hole - I like the idea of it being somewhat hidden, but that would put it somewhere under the bench which means that we can't use the cubby next to the table for shoes. If I put it in the front, it sort of destroys the goal of keeping the litter box hidden. Right now, I 'm leaning toward somewhere in the front, but I'll post a picture when it's actually done an installed. Currently, I have the bench and table all cut and dry fit. Tomorrow, I'll begin the installation and trim work. The shelves and the rest of the upper portion will have to wait until after Christmas. Altogether this project will probably cost about $600-700 including paint and the 3/4 plywood. Anyone else have ideas for how to use the mud room space in their Dunkirk?